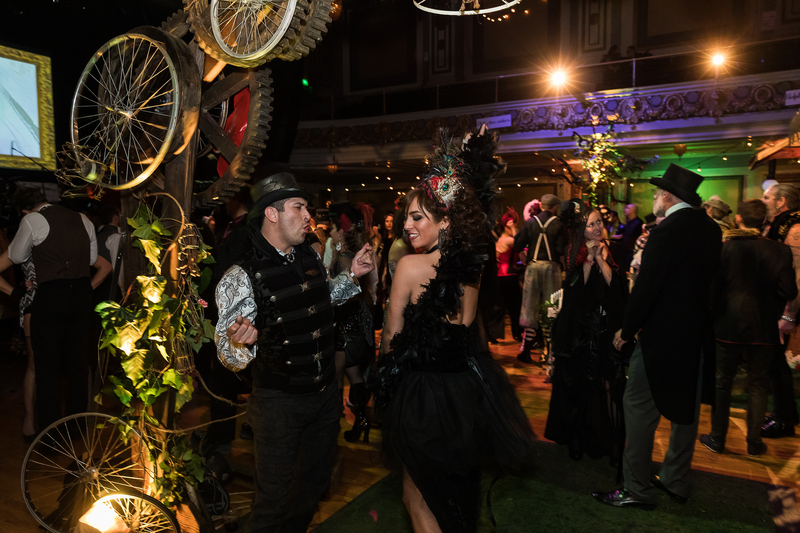 Revelers enjoy themsevles at the 2019 Edwardian Ball at The Regency Ballroom in San Francisco. Photo Credit: Zoart Photography. Entering the Edwardian Ball on the ground floor of the Regency Ballroom is comparable to stepping through a wardrobe and meeting a curious Satyr promising to guide you on your way. Which is to say, otherworldly, at the bare minimum. The Vendor Bazaar is a unique and immersive take on a common sales fair. Between the fantastic apparel, photography, art of all kinds and the fabulous cast of merchants I found myself spending a lot of time in the Bazaar even if I wasn’t in the market for purchase. Some of the most interesting characters of the whole evening can be found in the Vendor Bazaar, and that’s truly speaking volumes when considering the night’s festivities. But, of course, the ground floor is only the beginning. The entire event takes up multiple floors of the Regency Ballroom and, even with all that space, the venue seems to burst at the seams from all the wonder contained. Entering the main hall of the Regency Ballroom seems like nothing short of walking through a portal to a new dimension. It is a rich visual kaleidescope of masks, corsets, and tastefully extravagant ball gowns, all complimented by tea and cookies for $1. Honestly, it’s hard to describe with just words. But if there’s one thing to take away from the beauty and care put into this event by founders Rosin Coven and the Vau De Vire Society, it’s the true sense of community that permeates the atmosphere. Several hundred people are crammed into the venue and not a single one appears to be rude or unkind. Shoulder to shoulder at times, every person is constantly remarking, “oh so sorry,” “pardon me”, and “would you kindly.” One encounters people reuniting for the first time since last year’s Ball, with large smiles and happy greetings, complimenting costumes and gushing over the decor. Few communities shine like this! After an hour or so of ballroom dancing the performances begin, and Alotta Boutte did not sell short. A vibrant and extravagant performance kicks off the night before the Earles of Newtown take the stage and continue the delight.. All the while folks dance and laugh and greet one another. Even greater delights can be found in the Museum of Wonders, a few floors aboe the Grand Ballroom. Spaced out with several unique and isolated exhibits that blend into the surroundings like comfortable house furniture and a stage setting that is made of more than 100 interchangeable backdrops, it is truly a sight to behold. As I arrived, DJ Baz was performing with two living statues decorating each side of the stage. The magic of Geral Joseph came next and while they seemed relatively simple illusions, I still couldn’t figure out how he did most of his tricks. “The Trouble with Women” was a play set in 4 parts that was performed throughout the venue as the night went on, packed with comedic prose and impressive ballet dance. It was hard to catch every segment, but well worth the time and effort. Finally, when founders Rosin Coven took the stage near midnight to perform a stage adaptation of a Gorey short story, the night was at its peak. Very rarely is such vibrance and dedication shown on stage. Their care and love for the Edwardian Ball was apparent in the performance. The Edwardian Ball is a truly unique and majestic experience. Made for groups and partners, no doubt. This is a place for community and beautiful phantasmagoria. . The Edwardian Ball will present their next event in Los Angeles on February 9th, tickets can be found here.